Current chemotherapy and radiation treatment options for breast cancer patients are grueling, and not all patients see positive results, however with funding raised from the 2018 Pink Frangipani Ball, Dr Nikki Verrills and her research team hope to develop revolutionary new therapies. Dr Verrills, a cancer cell biologist with the University of Newcastle and Hunter Cancer Research Alliance – a major program within the Hunter Medical Research Institute (HMRI), is developing a new class of drugs that kill breast cancer cells. “These drugs act to switch on a tumour suppressor protein - PP2A - that is silenced in the majority of breast cancer patients who do not respond to standard therapy. The biennial Pink Frangipani Ball saw over 470 Novocastrians gather to support breast cancer awareness and raise over $55,000 for Dr Verrills and her research team to enter into the next phase of their trials. Dr Verrills said the proceeds from this year’s ball would have a very real impact on the development of her research, which is targeted at helping the average of 50 Australians who are diagnosed with breast cancer every day. Founder of the Pink Frangipani Ball and a Councillor on Newcastle City Council, Mr Andrea Rufo OAM, said he was thrilled with the total $105,000 raised to support Dr Verrills’ promising research work and local organisation ProCare - who provide free counselling services to women and their families dealing with breast cancer. Mr Rufo said the continual success of the Pink Frangipani Ball, aptly named in memory of his late wife’s favourite flower, would not be possible without the support of the attendees and sponsors. 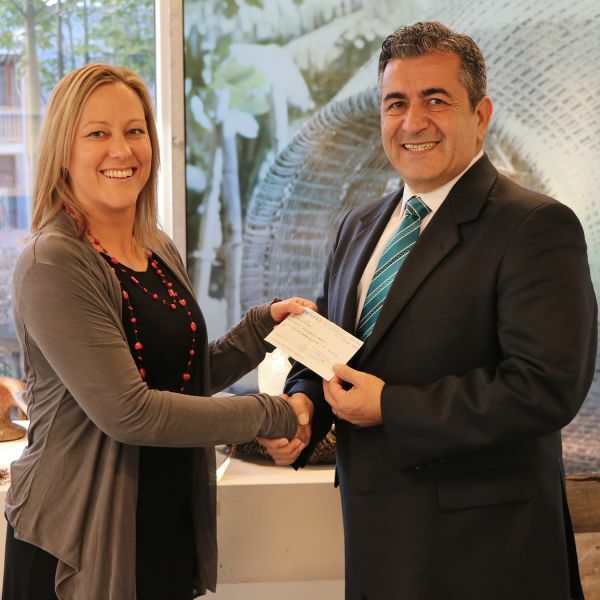 The University of Newcastle hosted an afternoon tea on Monday 25 June where Mr Rufo and his committee presented the proceeds raised from the 2018 Pink Frangipani Ball to Dr Verrills and her research team.